I was a vegetarian for a few years back in the 90s. I had ideals about what should go into a body and ideals about how the earth should be treated. My romance with a vegetarian lifestyle (while living in the midwest) ended when i looked at a package of bacon in the grocery and whispered to myself ‘ I like meat.’ Bye-bye vegetarian-ism welcome back carnivorous habits! Since I’ve spent most of my forty-something years as a carnivore I have a great love for The Meat: a good steak, chicken on the grill and any kind of fish, both fresh and salt water. Living in the PNW also feeds my ideals with more affordable and accessible options for local, sustainably raised meat. Growing up in Southern California I was raised on different ethnic foods so I love diversity of flavor. I was also raised on a daily serving of the poverty diet. Ours was not a ‘meat and potatoes’ kindof home. My sister and I lived in other countries during our years in graduate school. Each of us brining flavors and recipes home to keep the memories alive. So, this recipe represents some of my favorite things about my expereinces and about the world. It has grilled meat, cultural flavors, and goes beyond the poverty/midwest special (it’s ok if you like that. i think you’ll like this too). This most definitely, without a doubt, ain’t your mama’s chicken! 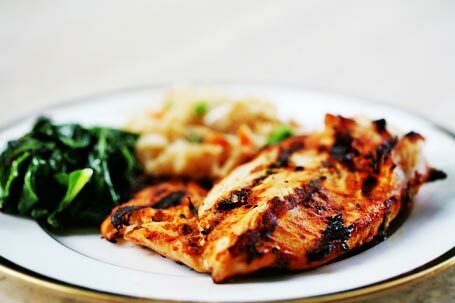 savory marinated, grilled chicken breasts with hints of cilantro, cumin and paprika. Mix the marinade ingredients (yogurt, cilantro, olive oil, garlic, paprika, cumin, salt and pepper) together in a medium bowl. Add the chicken pieces and thoroughly coat with marinade. Cover and chill in the refrigerator from 6 to 10 hours. Heat grill on high for gas or prepare coals for direct heat or plug in the Foreman! You can also use a cast iron pan on the stove if grilling isn't an option. Grill the chicken breasts a few minutes on each side until cooked through.Try not to overcook (i've raised two kids and several dogs on a diet of 'opps, i charred the meat). Take off the heat and serve with brown rice, sautéed zucchini, roasted asparagus or a good 'ole fashioned salad. Whatever makes you smile. You had me at the cilantro! Will have to try this!